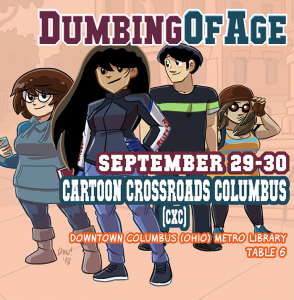 Dumbing of Age - I’ll be at CXC 2018 this weekend! I’ll be at CXC 2018 this weekend! This Saturday and Sunday, I’m gonna be at Cartoon Crossroads Columbus (CXC) here in my very own hometown of Columbus, Ohio. 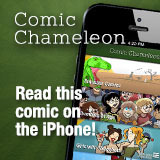 It’s an annual comics convention held at the library downtown! And, like, one of those real comics conventions, with actual comics people there. There’s bigtime comic book folks this year, like Brian Michael Bendis and Matt Fraction, and also us webcomic folks are represented, like Melanie Gillman, Ngozi Ukazu, and Blue Delliquanti. And also, crazily, announced at the last minute is special guest Olivia Jaimes, the enigmatic new artist behind the newspaper strip Nancy. She’s gonna have a late Sunday panel and we don’t even know who she really is, it’s exciting! It’s also a incredibly nice-looking location, with lots of windows. 90% windows. I mean, it’s a library. An amazingly-nice library. I was there a few hours last year and it was just… cozy. Anyway, I’ll be there! I’ll be at table 6! (It’s first thing on the right hand side, can’t miss me.) I’ll have books and magnets and probably some prints.